Each entry will receive a Blue, Red or White ribbon unless receiving one of the special awards above. REGISTRATION: June 17 – June 28, 2019, bring entries in person to the Webster County Extension Office (217 South 25th St., Ste. C12, Fort Dodge, IA – Crossroads Mall Center). Office hours are Monday –Friday 8 am – 4:30 pm. ELIGIBILITY: No work previously exhibited in the Webster County Fair Open Class will be accepted. Work must be original and the work of the photographer. Youth class is seventeen and under, Adult class is 18 and over. · All photographs must be mounted and unframed. There should be no hooks or wires attached. Do NOT cover photos with acetate or glass. Maximum size is 16” x 20” Minimum size is 5”x7” (including matting). The management will use all diligence to ensure the safety of all entries after their arrival and arrangement, but in no case will be responsible for any loss or damage that may occur. Superintendents have the option to close judging to the public. 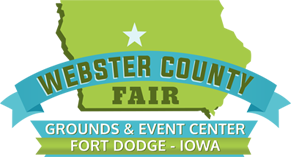 JUDGING RESULTS: Judging results will be on display at the Webster County Fair beginning July 10th, 2019. Pick up of photos from the Webster County Extension Office after July 21st, 2019.